Projections for the third-lowest net farm income in the last decade, record nominal agricultural debt, rising debt-to-asset ratios and interest rates, and continued headwinds for agricultural commodity prices had many anticipating an increase in farm bankruptcies in 2018. However, that is not currently the case. Caseload statistics from the United States Courts indicate that for the 2018 fiscal year, which ended Sept. 30, there were 468 Chapter 12 bankruptcy filings, down 8 percent, or 40 filings, from the prior year. Filings in fiscal year 2018 were down from prior-year levels but were approximately 25 percent higher than in 2014. Chapter 12 bankruptcies are designed for family farmers or family fishermen with “regular annual income” and provides a framework for financially distressed farmers to repay debt over a three- to five-year period. Importantly, Chapter 12 bankruptcies allow for seasonal payments to account for harvest and marketing schedules for farmers and ranchers. While down slightly from the 2017 fiscal year, during which 508 Chapter 12 bankruptcies were filed, the fiscal year 2018 data highlights the tough financial conditions across portions of rural America. 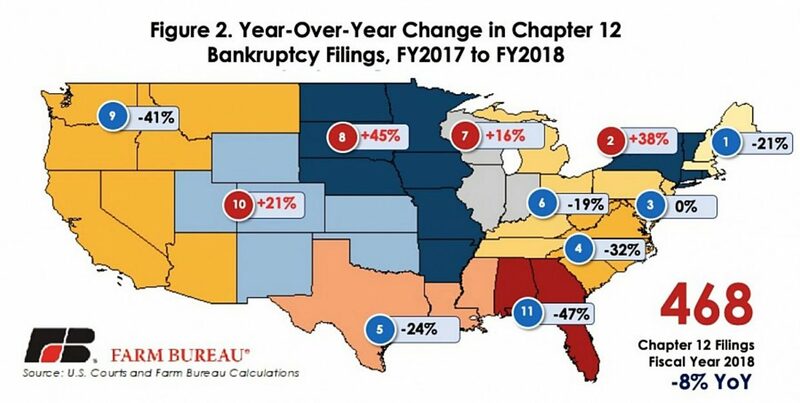 In four district court regions Chapter 12 bankruptcy filings were higher than year-ago levels. These districts represented producers in the Northeast, Midwest and Rocky Mountain regions. Of the 468 filings in the 2018 fiscal year, more than 50 percent, or 252 filings, were in the second, seventh eighth and 10th circuit court districts. These districts are highly concentrated with traditional row crop, livestock and dairy production. In these areas, year-over-year increases in Chapter 12 filings ranged from 16 percent to 45 percent (see figure 2). While bankruptcy levels are falling, USDA does not project improvements in solvency and liquidity ratios. USDA projects the debt-to-asset ratio to climb in 2018 to 13.4 percent — the highest level since 2009 and the sixth consecutive year of climbing debt-to-asset ratios. In addition to climbing debt and debt-to-asset ratios, the debt-service ratio is projected to increase to 27.8 percent — the highest level in 30 years — and the current ratio is projected at 1.44, the lowest level since the series was first recorded by USDA in 2009. Poorer performing farm financial indicators suggest some farms may soon be unable to service debt with existing assets. There are many different bankruptcy filing options, however, Chapter 12 “family farmer” or “family fishermen” bankruptcies are viewed as the best indicator of farm bankruptcy trends. These bankruptcies represent financially distressed family farmers who had to restructure financials and propose a repayment plan to avoid a liquidation of assets or foreclosure. Despite expectations that these bankruptcy levels would rise in 2018, Chapter 12 filings were down 8 percent during the 2018 fiscal year.